* great-great-grandfather Horris, having lost all 10 toes while attempting to summit Strawberry Hill in the dead of winter refused to live the remaining eighty years of his life as an invalid. 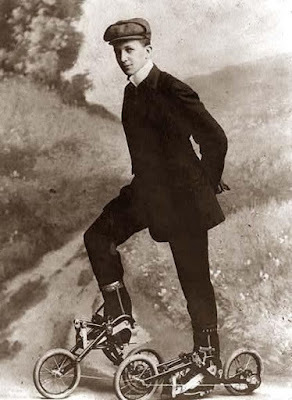 His "roller coasters" easily propelled him from one circus venue to another but also generated enough electricity to power the encrypted radio transmitter hidden just under his stylish hat. He was subsequently awarded the good Queen's Medal of Awesomeness.